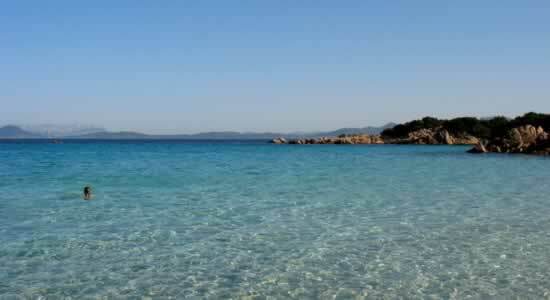 Costa Smeralda Sardinia Hotels Emerald Coast Travel in Costa Smeralda hotels Emerald Coast Sardinia Italy bed breakfast residence villas self-catering accommodation. The Villa del Golfo is a four-star hotel in Costa Smeralda, located in the village of Cannigione. The hotel offers views of the sea and of the island of Caprera. The hotel facilities include a restaurant, a spa with fitness centre and sauna, free wi-fi in common areas. The sea front rooms of the Hotel Villa del Golfo have safe and TV. The hotel is ideal to practise water sports. The Villa del Parco is a three-star hotel in Costa Smeralda, located in the island of La Maddalena, with sea views and excellent services. The beachfront hotel rooms are equipped with wi-fi and air conditioning. The Villa del Parco includes a restaurant serving local food, a game room and free car parking. The guests are highly recommended to practise snorkelling and hiking. The Hotel Cala di Volpe is a five-star hotel in Porto Cervo in Costa Smeralda. The facilities of this hotel on the sea are amazing: tennis court, restaurant, lounge bar and fitness centre. The sea front rooms of the Hotel Cala Di Volpe have satellite TV, safe and air conditioning. Guests of the hotel are reserved parking for free. The beaches are just a few minutes away. The King's Hotel is a two-star accommodation located in Costa Smeralda, in Golfo Aranci. This hotel, overlooking the seafront, offers rooms equipped with minibar, TV and air conditioning. The Hotel guests can enjoy a relaxing time in the lounge bar. The King's Hotel is perfect for snorkelling and diving. Marinella is a few kilometres from the hotel. Hotels with parking in Emerald Coast ? If you have decided to travel to Emerald Coast by car or motorbike, don't worry about finding a parking space or leaving your vehicle unattended. Display the list of hotels and accomodation in Emerald Coast provided with a parking place or a garage. Book a hotel in Emerald Coast with a parking area! Pet-friendly hotels in Emerald Coast ? Don't leave your dog at home. Use our guide to check the list of hotels and accomodation that welcome dogs in Emerald Coast. It is also possible, from our selected list of hotels and accomodation where animals are allowed in Emerald Coast, to keep your dog in the room with you! Check our offers of hotels and accomodation in Emerald Coast with rooms equipped for the disabled! For your stay in Emerald Coast, book a hotel accessible to disabled people. Choose your hotel in Emerald Coast from the list of hotels equipped to welcome disabled people! Wi-Fi hotels in Emerald Coast ? Are you looking for a hotel or accomodation with a quick internet access and wi.fi? Click on the list of hotels in Emerald Coast which have a wireless connection to internet and wi.fi. Gay-friendly hotels in Emerald Coast ? Look for gay friendly hotels or gay friendly accomodation in Emerald Coast, choose to sleep in a gay friendly hotel or gay friendly accomodation in Emerald Coast! Take advantage of our offers of gay friendly hotels or gay friendly accomodation to book your holidays in Emerald Coast.